Dr. Karl Koenig was an Austrian pediatrician and educator who fled the Nazi invasion of his own country and settled in Aberdeen, Scotland, in 1939 with a group of young physicians, artists and caregivers. These people founded the first Camphill community with children having developmental disabilities. Dr. Karl Koenig was an Austrian pediatrician and educator who fled the Nazi invasion of his own country and settled in Aberdeen, Scotland, in 1939 with a group of young physicians, artists and caregivers. These people founded the first Camphill community with children having developmental disabilities. Dr. Koenig and his colleagues were inspired by Anthroposophy, the teaching of philosopher and educator Rudolf Steiner, discussed below. 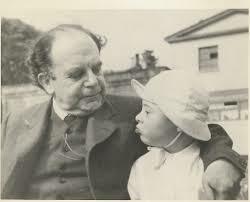 Dr. Koenig’s vision was to develop lively Camphill communities together with people who have disabilities. His special gift was to understand and focus on the abilities of each person, not the disabilities. Through teaching and modeling, he turned this gift into an effective approach for improving the lives of people with a range of abilities and needs, an approach based on community members teaching and learning from each other through the experience of day-to-day living. The Camphill pioneers developed the goal and some of the methods for how the needs of each person could be met in a cooperative community, each member contributing his or her own special gifts and talents. This vision lives on and each new generation in Camphill strives toward achieving it. Camphill was established in North America in 1959. Today, Camphill in North America consists of thirteen independent communities that are home to over 800 people whose daily lives are full of vitality and accomplishment. These communities serve and impact thousands of other people in the surrounding areas. The thirteen communities live and work on over 2,500 acres of land, which is cared for utilizing organic and biodynamic methods.